How to market yourself and your ideas today. Creative, digital, experiential. Sharing Your Ideas. How to Market Today. Sharing your energy without intention, without wanting something in return, is one of the most powerful actions any individual or organization can take. It transforms you from a consumer of energy, a taker, to a creator of energy, a giver. This simple act of unselfishly revealing your gifts to the world, adding something to the human experience, contributing, completes the positive energy loop that enables you to make your magic real. To be a great creator, to market yourself or your ideas effectively, you must share them without selfish intentions. Anything else is manipulation. Consider the current retail conundrum. For years, stores had seasonal mega sales. They did it because they were selfish and lazy. Instead of improving their product, building bonds with their customers, and creating value, they chose to manipulate customers into action with discounts. Customers only shop when there are massive sales, profits are eroded, loyalty becomes nonexistent, and, eventually, businesses close. 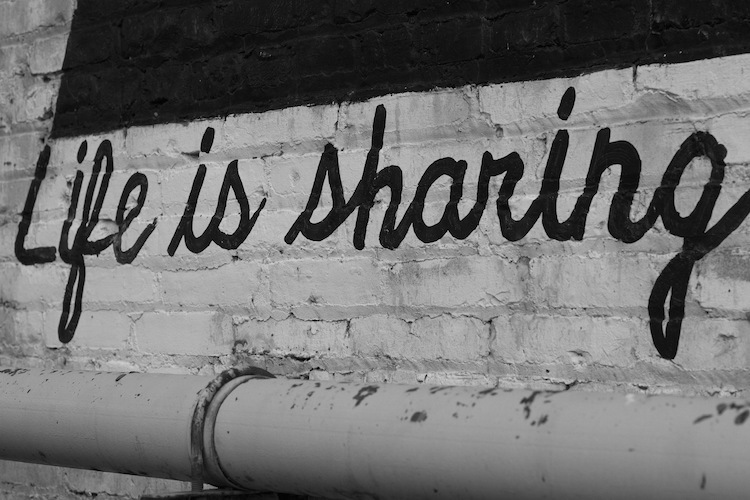 In a world where most consumers value meaning over money, experiences over material goods, and crave meaningful connections, the only way to break through is to share, not sell; to be selfless, not selfish. This change in values, combined with new technologies, has created a paradigm shift. The components of an effective marketing toolkit have changed. For instance, traditional public relations efforts have lost significant influence over consumer behavior with the introduction of social media. What used to be a controlled, one-way message like a restaurant review or gossip column hit, has turned into an active dialogue between brand and consumer, your Instagram or LinkedIn feed. Today this dialogue happens primarily through the combination of three channels: creative, digital, and experiential. Creative is how your brand looks, feels, and sounds. That’s everything from your logo to LinkedIn photo to all the content you produce, your videos, photos, blog posts, email newsletters, website copy, printed flyers or business cards, and much more. Creativity is more valuable than ever, and your brand must continually be a source of inspiring, beneficial, and consistent content that reinforces your core value propositions and beliefs. Digital refers to distribution. Creative is the message and digital is the way you get that message to the consumer. Digital channels are by far the most effective, efficient, and measurable ways to disseminate your idea. Whether you are referring to earned media—organic social media or press—or paid media—Google and Facebook advertisements—digital is the dominant method of communicating with your customers. The challenge in digital is matching the right message, your creative, with the right customer, the demographic or psychographic interested in you. While there are some amazing tools available to help you do that, like Facebook Business Manager and Google Analytics, it really is a high-tech game of trial and error. Test, test, and test again until you find your audience. Once you find them, do everything you can to preserve, protect, and respect that relationship. Experiential is where your idea comes to life in some physical form and your audience can interact with or “experience” your product, service, or beliefs. That could be in the form of an event, a live marketing activation, or even a full retail outlet. Traditionally, you couldn’t sell without a physical location; e-commerce has completely changed this construct. While today it doesn’t always make business sense to maintain that level of overhead, it’s still very important that customers be able to experience who you are and what you do. That may mean hearing you speak, tasting or trying your product, or creating a pop-up experience. Whatever you choose, the physical manifestation of an idea helps people understand it and gives them permission to believe more deeply. The final ingredients needed to effectively share your magic are consistency and persistence. Your audience wants to know you’ll show up steadily over time. No one wants to believe in something they can’t interact with regularly. Imagine your favorite football team didn’t show up every week, you would find another team to follow very quickly. That level of consistency is difficult and therefore requires persistence. Creating and sharing is messy work; you’ll get it wrong many times before you get it right. Your creative will change, your digital strategy will shift, you’ll do something shortsighted and selfish without even knowing it, and your first couple of experiential activations will probably be a letdown. But don’t allow those letdowns to get you down. There is no greater feeling than sharing what you believe in and having even one person choose to believe in that too. The struggle is the way.